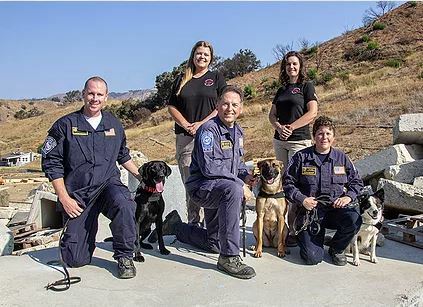 These dogs are part of a highly trained team dedicated to responding to disasters. NE-TF1 is one of 28 US&R task forces in the national disaster response system under the Federal Emergency Management Agency (FEMA). Urban Search & Rescue is a multi-hazard discipline as it may be needed for a variety of emergencies or disasters, including earthquakes, hurricanes, typhoons, severe storms and tornadoes, floods, dam failures, technological accidents, terrorist activities, structural collapse and hazardous materials release. US&R Canine teams play a critical role during rescue response incidents. Canines use their incredible sense of smell to detect human scent, even from individuals buried deep in rubble. The canine team is tasked with working in disaster situations in search of live, trapped victims. The canine's job is to locate victims in these disasters and alert their handlers to their location. In addition to training canines to locate victims in a disaster, the handler also receives additional training which aids in their safety and ability to function effectively and safely in a disaster situation. FEMA US&R canine handlers are comprised of civilians, firefighters, and police department members. Most of the certified canines are Labrador Retrievers, German Shepherds, Belgian Malinois, Border Collies, and Golden Retrievers. Canines with high "toy drive" are used for urban search and rescue work. It is a game of hide and seek for the dog. In training we have volunteer victims that hide with a toy. When the dog alerts to their location the volunteer gives the dog the toy and plays with them. By the time a dog is on a real search they are willingly looking fr trapped survivors. To certify as part of the team a dog must pass a grueling test that includes obedience, agility, scenting as well rubble searching. As you can imagine, this type of training takes a great deal of time, dedication and effort. The majority of a canine handler's work is on a volunteer basis. Many of the dogs are from the Search Dog Foundation. This is a non-profit organization whose mission is to strengthen disaster response in America by rescuing and recruiting dogs and partnering them with firefighters and other first responders to find people buried alive in the wreckage of disasters.